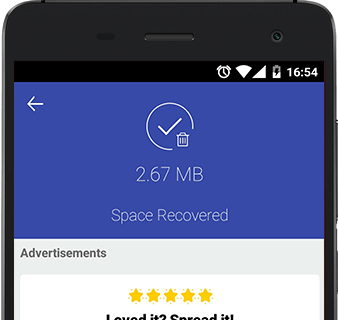 The most trending app that scans & lets you remove duplicate & similar photos from your device’s internal & external storage. What is Duplicate Photos Cleaner? 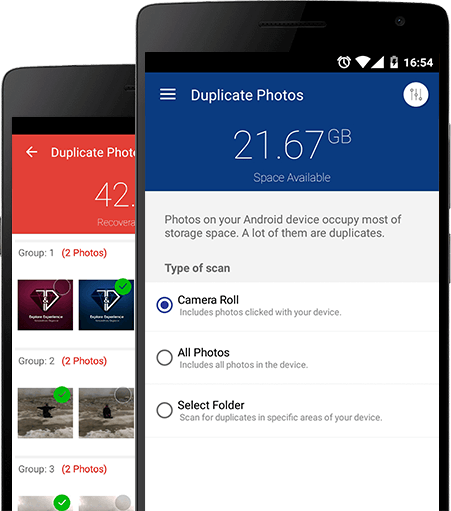 Duplicate Photos Cleaner is an app dedicated towards recovering chunks of storage space on your Android device. And how? By giving you the power to delete duplicate & similar photos hiding in every corner of your phone's internal & external storage(if attached). Get rid of these duplicates & keep your Gallery organized! With this primary feature, you can scan for exact duplicate & similar photos hiding in every corner of your Android device. So keep snapping till you get the best shot. This app will guide you in fixing these duplicates. 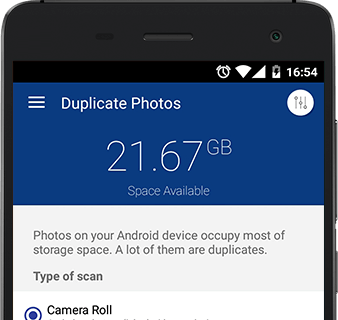 You have full control to scan & remove duplicate & similar photos from your Android device's internal as well as external storage. Start organizing your digital memories the right way now. It works! For your convenience, we have given you a perfect blend of settings which will help you refine your search results. Just play around with the settings to easily find duplicates on the basis of Matching Level, Time Interval & GPS. How does Duplicate Photos Cleaner work? Duplicate Photos Cleaner is an automated tool that helps you scan & remove duplicate & similar photos. Even more, it works on both internal & external storage. It's a big time saver. You don't have to go through your photos manually. A few taps, and you're done! Tap on a setting of your choice & start the scan. Preview the duplicates. Then mark/unmark photos of your choice. Tap "Remove Duplicates" & see your space being recovered. Why choose Duplicate Photos Cleaner? 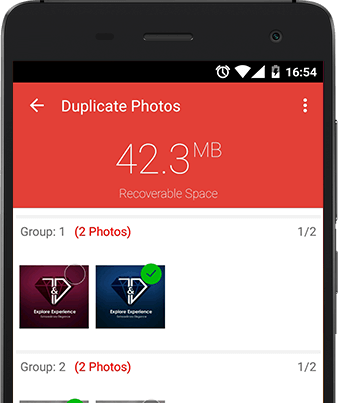 Duplicate Photos Cleaner is a nifty little app that helps you in recovering chunks of storage space from your internal as well as external storage. So if you'd like to organize your Android device's Gallery, this is just the app you need. You can organize your precious photo memories just the way you want. It helps you save loads of time. You don't have to manually go through your photos before deleting them. This app worked the way I wanted. It helped me delete all my duplicate & similar photos from my Samsung S4. It is highly recommended. Copyright © PCVARK 2019. All rights reserved. Microsoft and Windows are trademarks of the Microsoft group of companies. Mac and OS X are trademarks of Apple Inc., registered in the U.S. and other countries. All other trademarks are the property of their respective owners. Payproglobal is an authorized reseller of PCVARK’s products.